Strategies for killing each of the game's creatures. A complete list of the different evolution events in Ark's Survival of the Fittest mode. A quick look at the Dragon in Ark Survival of the Fittest. The best ways to farm wood in Ark: Survival Evolved. Farming wood quickly in Ark: Survival Evolved is extremely important for early base and equipment construction. If you’ve been out there with your stone hatchet hacking away at trees, you’ll know that it can be a very time consuming repetitive process just to get enough to make a single wall piece. While the game doesn’t offer any real shortcuts to get around the need for wood (except for moving on to other building materials, most of which still require it in some form), there are some methods that make the gathering faster and less laborious. While you don’t unlock access to metal equipment until the mid-20s, many higher level players are willing to trade materials in exchange for crafting them for you. Metal Hatchets are much more efficient at extracting wood from trees than their stone counterpart. You can usually expect to get 15 – 20 wood from a single tree with a metal hatchet. Farming wood that quickly will eat up your weight capacity very fast, so it’s always a good idea to have a tamed creature to serve as a pack animal for you. Pteradons are good pack creatures because they do not lost stamina if they are overburdened while following so you can load them up as much as you can. Larger creatures like Paras also make good pack animals and will at least triple the amount of wood you can bring back each trip. These lumbering ancient elephants are quite possibly the best way to gather wood in the game. Simply walk up to a tree and attack it to farm wood from any trees in front of the Mammoth. 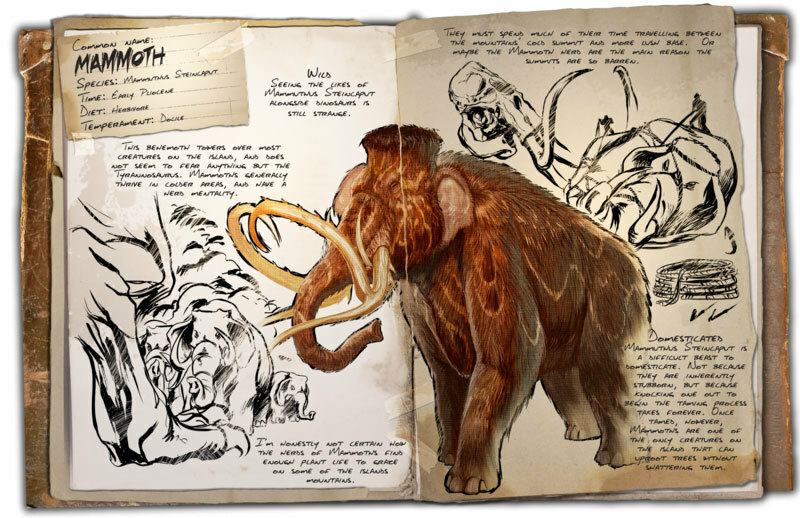 The Mammoth also gathers very little thatch because it uses its tusks to uproot entire trees, a nice bonus that will save your inventory for more wood. Pair that with a large weight capacity and your wood gathering worries will be over if you manage to get yourself a pet Mammoth. It’s important to note that other creatures like the Bronto, Trike, and Anklyo can all destroy trees but when they do they primary get thatch and very little wood. For a pure wood gatherer there is no beating the Mammoth. You’ll need to be at least lvl 40 before you can craft the Mammoth saddle, or you can find a tribe mate/ friendly person to make one for you. When you’ve got one the best place to find a Mammoth is in any mountainous area, more often in the interior of the island. Be careful though, this area is also home to Sabretooths which travel in packs and inflict heavy damage. Items required to tame a Mammoth are 50 – 100 Narcotics and around 300 Mejoberry. To read the latest guides, news, and features you can visit our Ark: Survivor Evolved Game Page.